My first gig of 2017! I opted for some thrash metal this time. Old school German thrash metal to be precise…I have technically seen Destruction live before, a long time ago at a festival in a small town in Spain during my year abroad as a student. Now, a decade later I got the opportunity to see them live again this time in Tampere. In summary this was a great way to spend what would have otherwise been an uneventful Tuesday night. I really enjoyed Nervosa and Destruction are always entertaining to watch. What a great start to the year! « After several journeys around the world and great festival tours, we are finally back with an European headlining tour! And we’re looking forward to presenting a “Best of 30 years” without any curfew, we could hardly play at any festival. With LOST SOCIETY & EVIL INVADERS we got two aspiring and sensational opening acts with us to heat up the audience very night! This generation clash will serve you the finest and most excessive Thrash & Speed attack yet to seen! I hope you are still very HUNGRY!!! 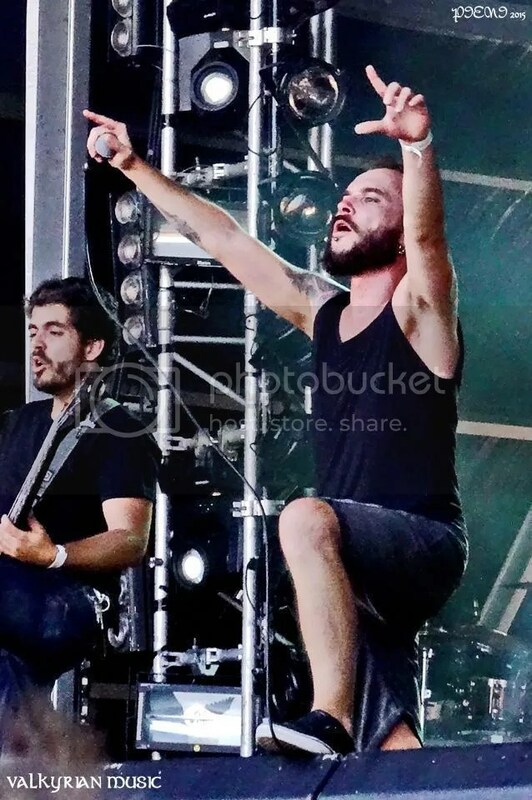 !» says frontman Schmier. 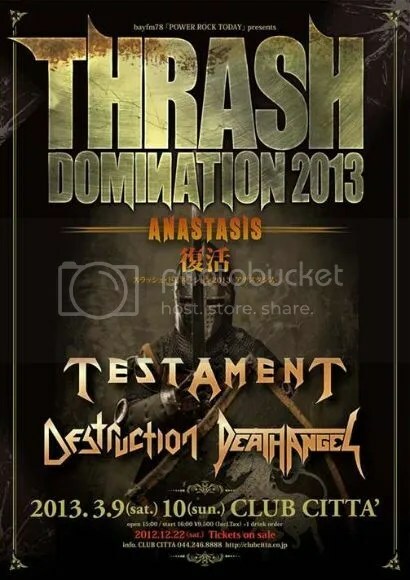 Bay Area thrash metal legends Testament have scheduled two exclusive shows in Japan in March, 2013 with thrash legends Destruction and Death Angel. The shows will take place on 9th and 10th March, 2013 at Club Citta in Kawasak-Shi, Japan. Fans can pre-reserve their tickets at this location this coming Saturday (8th December). Tickets will then go on sale everywhere on Saturday 22nd December. Further information on the exclusive shows can be found at this location. Testament also recently announced their first US headlining tour in support of their new album, Dark Roots of Earth. 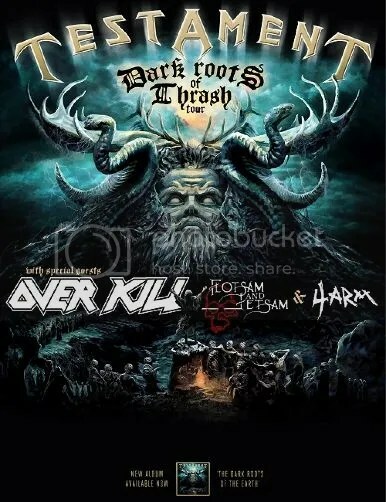 The trek promises to be one of the best thrash metal line-ups of the year, with support coming from the world renowned Overkill and Flotsam And Jetsam, as well as Australian thrashers 4ARM. VIP packages are now available for each show but will be on a limited basis per gig. Act now before they’re all gone! – Meet and Greet with members of Testament. – Photos with members of Testament. – Special VIP collector pass. 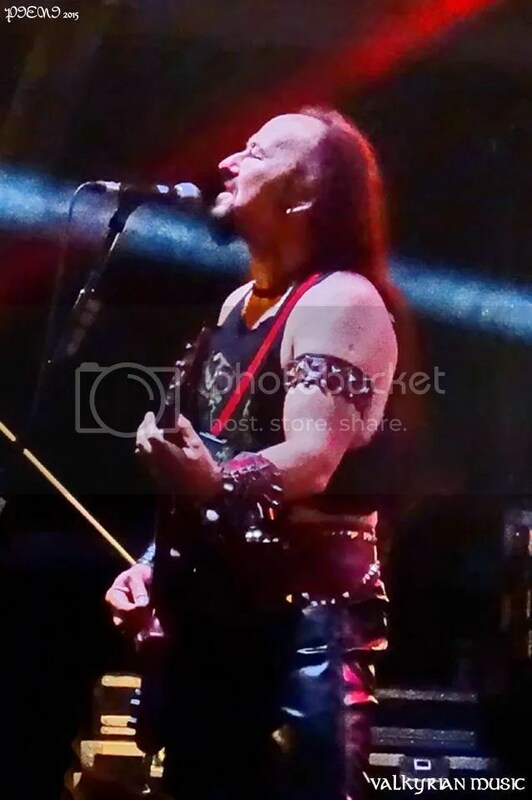 – 8×10 photo of Testament. – Discount Coupon for online shopping. – VIP purchasers will receive a raffle ticket. Two lucky raffle winners per show will get to watch a portion of Testament’s set side stage with the opportunity to sing background vocals on ‘Into The Pit’! – All VIP purchasers will be in an end of the tour drawing for a signature Eric Peterson Dean guitar signed by Testament. Teutonic thrash metal kings “Destruction” are back with their new album “Day of Reckoning”. The band have stated that this album will go “more back to their roots”. The album begins with “The Price” which straight away proves to be the beginning of a very promising album. 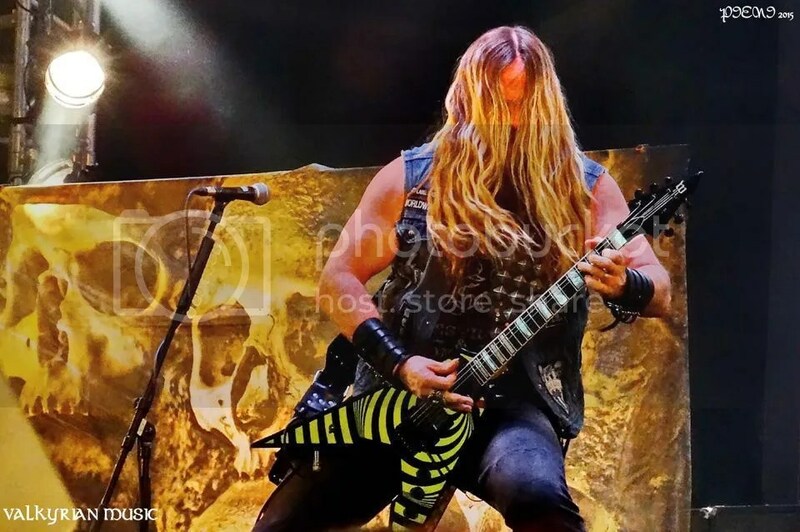 The guitars just blitz the ear drums, the vocals are raw and aggressive and the drums have a good ol’ thrash styled brutality to them. The guitar solo is insanely brilliant as well. 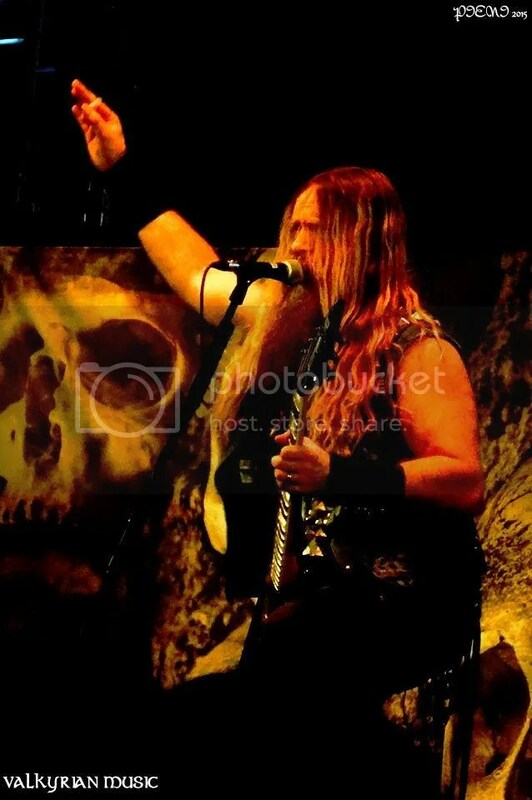 “Hate in my Fuel” comes straight after and it carries on the thrash-styled blitz with a fast-paced and heavy intro riff. The vocals, again, are raw and aggresive sounding. Parts of this track sound as if there is some influence from old-skool Megadeth. “Armageddonizer” follows right after. It sounds slower paced compared to the last two tracks but just as heavy. The best parts of this track would have to be the bass only section followed by the guitar solo. The track is “Devil’s Advocate” which features a brilliant use of technical riffs and speedy chugging. The vocals sound as if they’ve become more aggressive on this track as well. The guitar solo has a very old skool sound to it as well. The title track “Day of Reckoning” comes next. It’s drum intro followed by a high-pitched wailing guitar riff is just immense. The track soon turns heavy, with a great use of double bass pedal, beasty riffs and raw vocals which sound almost death metalish. This track is, without a doubt, the best track on the album. The next “Sorceror of Black Magic” takes a heavyness up a step. Everything sounds more brutal on this track, especially the drums and vocals. 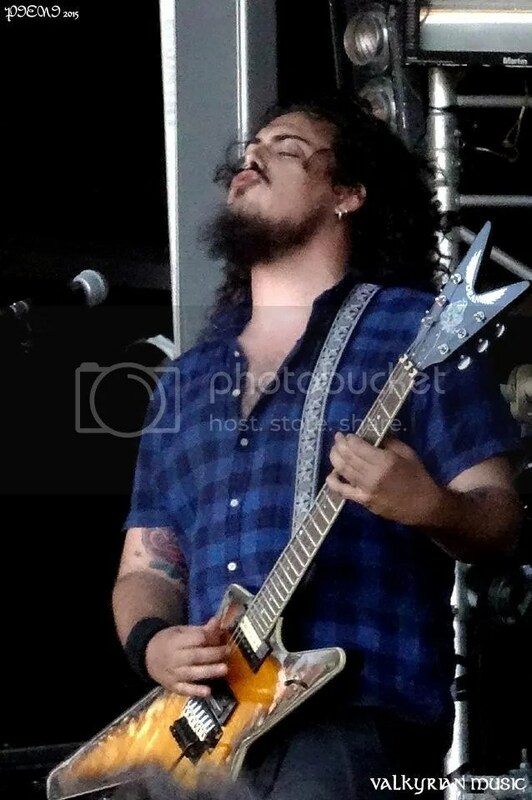 The guitar solo has a slightly modern sound to it mixed with an old skool influence. 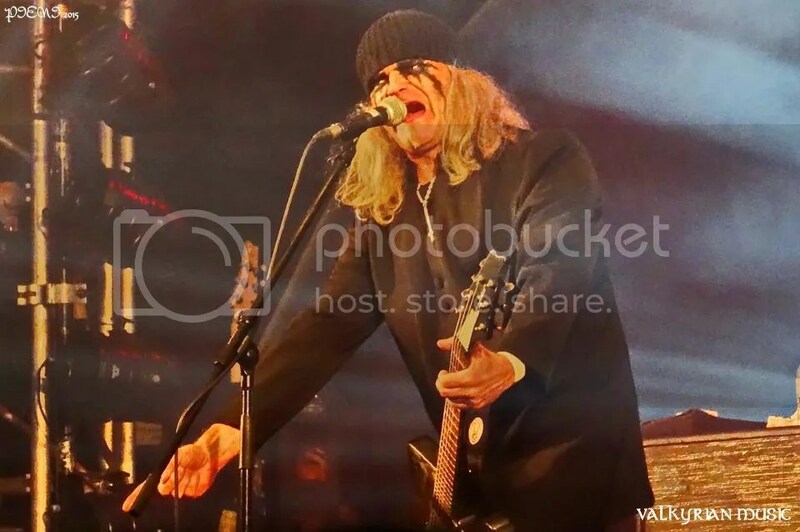 “Misfit” comes next and it has taken a the heavyness down a step, though in some parts of the tracks, the drums sound as if they’re overpowering the drums. The guitar solo isn’t as impressive as the previous ones. “The Demon is God” is next and it’s intro riff sounds a tad similar to the intro of Iron Maiden’s “Number of the Beast”. The guitar solo half through is a vast improvement compared to the one in the previous track. “Church of Disgust” is on after and it begins with an unsynchronised chanting of the Lord’s Prayer before an intro solo comes blasting in. The track sounds like it’s been slightly influenced by “Sabbat”. The vocals retain their raw and aggressive sound and the guitars and drums sound as heavy as they have been on previous tracks. The next track is “Destroyer or Creator”. It begins with a slow but heavy intro. The tempo increases a bit once the vocals kick in. The drums sound brilliant and the short guitar solo halfway through is just epic. “Sheep of the Regime” is next and in true thrash metal style, it begins with an aggresive intro and the lyrics have a very political meaning. The final track is a cover of Dio’s “Stand Up and Shout”. While not as aggressive as the rest of the album, it still proves to be a brilliant track and a great tribute to the metal god himself. This is an extremely enjoyable album, from the immense guitar riffs, the heavy drums, the raw vocals and the brilliant perfection. Destruction are like a fine wine – They just get better with age and this album proves it!